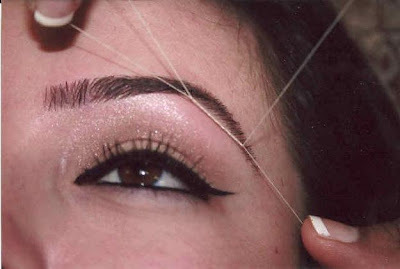 If you are planning on having your eyebrows shaped before your wedding, it’s best to avoid getting them waxed. Waxing doesn’t just remove the hair, but actually removes a majority of dead skin cells from your epidermis, the top layer of skin to which the make-up foundation used on your wedding day must stick. It takes up to one week to fully rejuvenate your cells and by that time you will already have had hair re-growth. Instead, try a technique called “threading”. It’s far gentler on your skin than waxing and creates very clean and professional results. There are ample local Indian salons and spas that specialize in this style of hair removal and the cost is surprisingly inexpensive at usually no more than $10 - $15 for combined Hair and Lip treatments. Try it out a couple of months before the wedding to see how you like it and then schedule an appointment to have the wedding threading done two –three days before the big event. A little known fact is that hair that has just been washed and dried does not take curl as well as hair washed one day prior. The best thing to do is to wash your hair the night before your wedding so that natural oils have a chance to build up while you sleep. Your hair will then be able to hold any curls applied that much longer. If you have ever wanted to try more adventurous hair removal techniques now’s the time to do it! Laser Hair Removal is fast, easy, not as painful as waxing, and has a very high success rate for permanent removal of the hair shaft. Popular areas to remove hair from include the face, underarms, and arms. Underarms are best treated with laser hair removal as it will leave you with smooth, clear and bright skin. Shaving and waxing might leave a shadow or red spots which can be unsightly. It’s best to start well in advance of your wedding. In order to extinguish all the hair growth you will need at least 3 treatments on the same area spread out over an average 6 month period. This allows the laser to affect all 3 cycles of hair growth and therefore provide the best results. Full leg treatment frequency is every 2-3 months. Most people require 5 to 8 treatments on this area, but it varies depending on skin and hair type. Eyelash extensions are another fun way to give your eyes that magnificent and illustrious look and also a great way to avoid smearing your make up when you cry those happy tears! 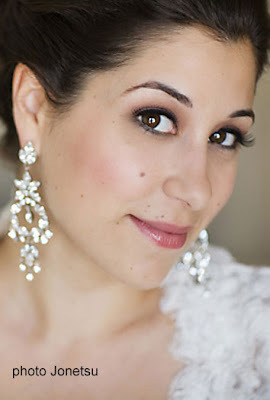 Every bride wants to have soft, dewy looking skin on her wedding day! This can be easily achieved by using a light exfoliant or mask which helps remove dry surface patches as well as encourages skin cell turnover. Your skin will feel immediately softer and your makeup will glide on that much better. Hydrate your skin with a moisturizer that suits your skin type. Even oily skin benefits from an oil free moisturizer. Your skin will appear plump, smooth, and your makeup will sit well on well nourished skin. When possible, choose makeup products that are long wearing, water resistant or water proof. Several companies sell, not only waterproof mascara, but eye shadows, cheek stains, eye liners, and foundations that are long wearing. Brides should try all the makeup for her chosen look before her wedding day. Have a consultation with your makeup artist to ensure you have no reactions to any ingredients. Lastly, plan well before the wedding to ensure skin is in optimum condition: drink plenty of water, eat well, exercise, try to avoid stress and get plenty of rest. All these tips will help create a flawless looking palette for your photos.